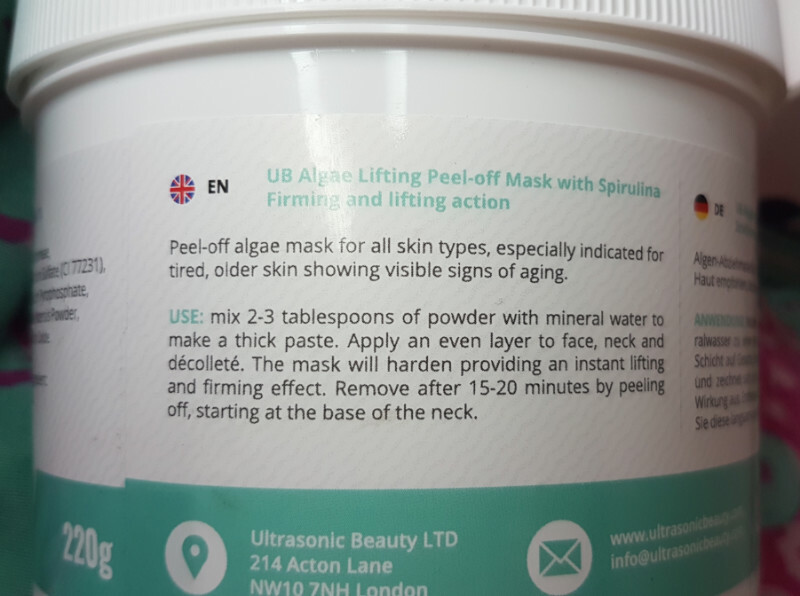 To mix, you need to add 2-3 tablespoons of the Ultrasonic Beauty Algae Peel-Off Mask powder into a bowl and add some mineral water. Mix until it creates a thick paste. Apply the paste straight away to clean, dry skin and allow to go hard (around 15-20 minutes) before peeling it off the skin, starting from the base of the neck. 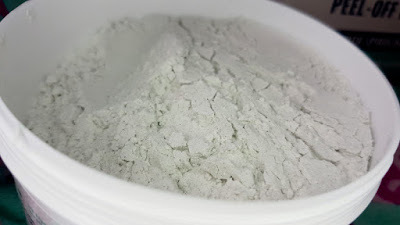 I’ve used masks that you need to mix yourself with water (such as the Niikam Pure Clay Mask), and I’ve used plenty of peel-off masks, but I’ve never actually used a powder mask that becomes a peel-off mask. It left me feeling curious as I was using it as to what kind of peel-off it was going to be. Was it going to be an easy peel-off mask, or more along the lines of a tough charcoal mask that really rips the dirt out? I found the answer to be a bit of a mix of both, thrown in with its own unique twist. The instructions make it clear to make the mixture into a thick paste and to apply an even layer, but it doesn’t indicate how thick a layer that needs to be. Therefore, I did a bit of experimenting and trial and error to come with more info for this review. The first time I mixed the mask, I followed the instructions exactly as the box states. I used 3 spoons of the mixture and added the water. This gave me a lot of mask which was more than enough to cover my face and neck. In fact, I had a lot of excess. So rather than to waste it, I decided I’d go with a fairly thick and even layer of mask across my skin to test it out. The instructions say to wait until the mask turns hard, and usually that’s a visibly noticeable effect. With this mask, I could see that the edges were becoming a lot lighter in colour and turning harder but the rest of the mask looked to be still drying. However, when you touch the mask, you realise that it’s turned into what can only be described as a prosthetic feel. It looks like you’re wearing a kind of prosthetic mask. This effect is only increased when you begin to peel it off. It has a rubbery type of feel to it that feels in some ways weird, but other ways oddly satisfying. The mask peels away so easily and leaves your skin feeling and looking firm and mattified, but bright. The issue I did have with it though was the edges that had turned noticeably hard. These areas felt different when being pulled off. They were tougher to remove, but they did still peel. It made me curious as to what would happen if you were to use a thinner layer, so for my next use a couple of days later that’s what I did. Instead of mixing a few spoons of the mixture, I tried just one. I mixed in the water and applied a thin, even layer to my skin. I left it on for the same duration as the day before (about 15 minutes) and in this time the majority of it had turned hard like the edges had done originally. The problem though is that it felt very uncomfortable. I began to peel the mask off and realised very soon into it that a thin layer is definitely not ideal. The areas that were hard were painful to remove and needed water and a cloth to help to peel it off better. The areas that hadn’t turned hard were comfortable and easy to remove, and my skin looked and felt fine. The other areas had turned red. Thankfully the redness was temporary. The skin still looked great after the redness had subsided, but it meant that I was able to feedback about the application properly. You need a fairly thick layer of the mask applied to the skin. It doesn’t have to be super thick, but a nice average amount lathered on evenly on the skin is perfect. I don’t want this experiment I did to be off-putting in any way to anybody reading this. The fact that I tried it and am able to forewarn you means that you can use this mask to the best effect without having the same problem. The results that you get from using the mask properly are amazing and are well worth trying out this mask for. I think that this mask is perfect for all skin types. 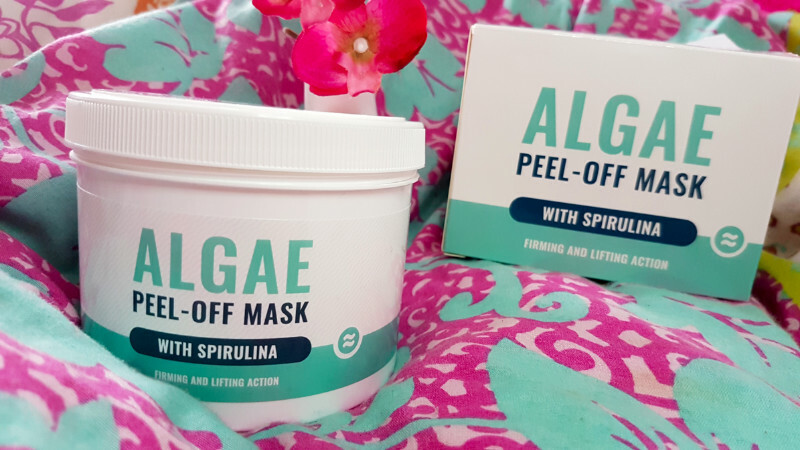 It’s targeted towards dry skin, but the mattifying, shrunken pored results you get mean this mask would be perfect for those with oily skin too. The cool, softening, hydrating feel you get means it is great for drier skin. It doesn’t aggravate spots either. The fun side of this mask is the colour and the texture, meaning that when it’s dried you may feel a little like Shrek. There’s also something really appealing about pulling off the rubbery end product. Some peel-off masks can leave bits of mess and mask behind that can become a bit stubborn to remove with water afterwards, but this mask is very mess free. As long as you get the thickness right, it all peels off easily and well. Even if there is any excess, a muslin cloth and a bit of water help it peel off just as easily. It’s even easy to clean from the bowl you use to mix it as you can let it dry and simply peel it out. Overall, I think the Ultrasonic Beauty Algae Peel-Off Mask is is a really great face mask. It’s does a brilliant job at making the skin feel firmer and more hydrated whilst also minimising the appearance of pores and being mess free. It’s great for all skin types, so even if you don’t have drier, fatigued, mature skin, you’ll still find it a good product to try out. You can purchase the Ultrasonic Beauty Algae Peel-Off Mask from Ultrasonic Beauty. What are your thoughts on the Ultrasonic Beauty Algae Peel-Off Mask? What are your favourite face masks?